Offer hesitating visitors automatically a surprise and sell more! A lot of visitors, but you want more buyers? Visitors who come and go to compare? Visitors who hesitate about buying? Surprise and convert these hesitating visitors into new customers! Choose a surprise. Bijvoorbeeld een gratis product, gratis verzending of een kortingscode. Remember smartphone visitors after their visit automatically and see conversion rise. Shopboost is easy to integrate into the shop. Customize the design based on the shop's identity. With all packages you can adjust and configure the hesitation detection and the surprise yourself. It costs 1 credit when a visitor accepts the surprise. - Not satisfied, money back! Based on specific needs a customized proposal for a fixed monthly fee. 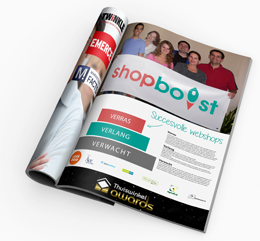 Shopboost helps to surprise webshop visitors who hesitate. We also like to surprise our customers. Never miss a surprise and sign up for free. 46 customers reviewed Shopboost with an average of 9.1 via The Feedback Company!